Shaped like a person and sculpted from casts of adolescent’s ears, “The Listener” stands underwater in tropical Cancun, collecting sounds that will tell scientists like UNCG’s Dr. Patricia Gray more about nature’s symphony and how human interaction affects it. “The Listener” is a result of a collaboration between Gray, director of UNCG’s BioMusic program, and marine biologist Heather Spence. 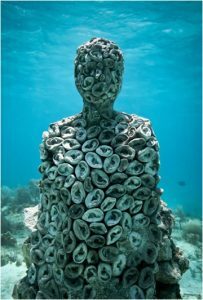 The innovative installation, located in the National Marine Park of Cancun in Cancun, Mexico, and sculpted by artist Jason Taylor, includes a NOAA-designed hydrophone which will record the sounds of the reef environment on a water-resistant internal hard drive for future analysis. “The Listener” is one of three hydrophone projects Gray has deployed in recent months in Mexico. The others are located on Isla Contoy and in the migratory channel at the north end of Isla Mujeres. The collaboration is a project of the BioMusic International Research and Education Project (BIREP), which is directed by Gray.